When the subject of the Alexander Technique comes up in conversation, I’ve found that people who have heard about it often have a very distorted idea of what it’s all about. This is not surprising because the Technique is concerned with the quality of how our bodies function as we go through life. And for the most part, our culture tends to emphasize what we do rather than how we do it. 1. The Alexander Technique is a type of physical therapy designed to take care of conditions like back pain, stiff necks and shoulders etc. It’s certainly true that many people take Alexander lessons because they are in pain and have been told the Technique can help them. And a great many are helped. But Alexander Technique teachers are very careful to present our work as being educational in nature; we teach people how they can become more sensitive to messages their body is sending them, and how they can respond in a useful and constructive manner. Put another way, we show our students precisely what they are inadvertently doing to themselves that gets in the way of their natural functioning – and then how they can sit, stand, move and perform their daily activities without unnecessary and harmful tension in their bodies. Relief from pain often comes about when this excess tension is released, but an Alexander Technique teacher has no way of predicting just how and when this will occur – or, for that matter, offer an absolute guarantee that it will happen. Sometimes, in fact, a pupil has “therapeutic” benefits they never anticipated. They may have come for lessons because of back pain and discover that their asthma symptoms have abated. 2. The Alexander Technique is really only for performers. Again, it’s true that musicians, actors and dancers constitute a sizable proportion of Alexander Technique students – perhaps as many as half for some teachers. And Alexander teachers often teach in schools of music, drama and dance. But the Technique has always been used by people from all sorts of occupations. Among my current students is a carpenter, a dentist, a massage therapist, a university professor and an accountant. Performers are attracted to the Alexander Technique because the quality of how their body functions directly influences the quality of their performance. Also many performers, especially musicians and dancers, are in pain because of the demanding nature of their work. But we are all have to “perform” activities as we go through life, and while we may not be judged as immediately and as closely as a dancer or singer, the manner in which we do things still has a great influence, for better or for worse, on our overall health and well-being. 3. The Alexander Technique is not something to consider if you’re an older person – habits of posture and movement are too deeply entrenched to change after a certain age. It’s true that it’s easier to change harmful habits when you’re young. In fact, F. M. Alexander, the developer of the Alexander Technique, felt that the best place to teach his method was in the early grades of school. On the other hand, most children are not particularly interested their posture and co-ordination. In part this is because the harmful habits they may have acquired have not yet caused them pain or discomfort. Also they have so many other things going on in their lives that posture or movement patterns usually seem pretty far down on the scale of things to be concerned about. In fact, many Alexander Technique students are not particularly young. Professor John Dewey (the philosopher and “Father of American Education”) was almost 60 when he had his first lesson. George Bernard Shaw, the great playwright, was 88! I presently have a student who is in her late 70’s who has, for the past few months, been rediscovering what it means to play the cello with ease and joy. 4. Learning the Alexander Technique takes a long time and is expensive and difficult. It is true that some people – like myself – become so interested in the Alexander process that they take lessons for years and even go through the intense three-year training process to become a teacher. It is also true that the Technique asks you to think about yourself in ways you are probably not used to. But the basic principles underlying the Technique are very, very simple. Indeed, the Alexander Technique has sometimes been called “applied common sense” applied to the body. Most people get the help they need to make significant changes in a few weeks or months – it’s not something most students study for years and years. The cost of an Alexander Technique lesson is usually on a par with the cost of a massage. In addition, some teachers offer group classes which brings the cost down significantly. So if any of these misconceptions has deterred you from exploring the Alexander Technique, take a lesson or two and see for yourself what this century-old method can offer you. If you’re an Alexander Technique student or teacher, I’d love to hear how your concept of the Technique changed once you started having lessons. Great blog, Robert. My conception of the Alexander Technique has changed a lot. I was very interested in finding the “correct position” to hold myself in and thought this is what the AT would teach me. What I learned, however, is that there is no correct position and I that it’s best not to “hold” myself! My posture did indeed improve, but in a way that is freeing and releases tension and is useful to my overall functioning, rather than just superficial. I think this is a common misconception of both good posture and the Alexander Technique – that it is something stiff, held and difficult to maintain. This couldn’t be further from the truth! Before I started studying it, (30+ years ago) I thought Alexander Technique was sort of a martial art of consciousness study, without the usual cultural trappings attached. Actually, that preconception wasn’t too far off. Everyone else thought I was studying because I had a limp. I was sort of surprised when that began to disappear, because I thought that there was nothing that could be done about that other than to ignore it. I got 3/4 of an inch taller too…another unintended result. You’re absolutely correct Franis – in some ways the Alexander Technique is all about unintended results – pleasant surprises! I thought the AT was about posture before I had lessons. Now I believe it’s about changing our thinking, particularly our “fixed ideas and preconceptions” (FM Alexander’s phrase that described the pupil’s greatest problem) in order to change our lives. In the process of disciplining our conscious thinking, our bodies recover, as we stop putting tension in our muscles, tension which is caused by our fixed ideas and preconceptions. I didn’t know what it was. I was dragged along to sort out my posture, which had something to do with my badly rounded shoulders. I didn’t really realise my posture displayed my apathy, my depression, my pain, my lack of confidence. So I went along and felt better which made me curious to learn more. 13 years later I am more devoted than at the start. I too gained half an inch. I may have gone in the door with physical issues but I came out with a whole new outlook, calmer mind, more aware of my emotions and a path into spirituality as well as the desired better posture and understanding what it is. A 4 dimensional person, full of life instead of a 2 dimensional up or down person surviving life. I can’t imagine not using it, philosophising about it, sharing it. I’d hate to imagine where I’d be had I not found it. Thanks for this post, Robert! When speaking of the cost of Alexander Technique lessons, I think it is important to remember that it is a “do it at home” technique. So when you’re studying it, you’re not just doing it for 45 or 90 minutes per week. You get to practice it hours a day, every day, as you go about your life. That’s a good point. I always tell my students that they’re going to have to do the real work. 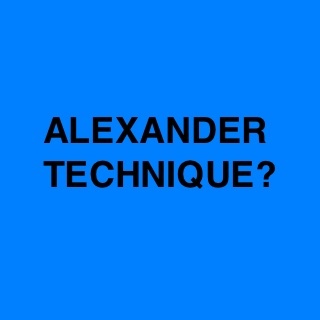 Now Alexander Technique was something new to me. Glad you wrote a post about it and so I know. I’m glad it was useful.